It's not difficult to change a will. You can amend, modify, update or even completely revoke your last will and testament at any time, provided you're mentally competent. You have a few options depending on what you want to change. Make sure you follow the letter of the law in your state so your will won't later be declared invalid because you made changes to it. State laws can differ, so it's advisable to have a local estate-planning attorney review your finished product to make sure you've done everything right. In some states, your mistake can be as minor as crossing things out and adding new provisions to your existing will in your handwriting. 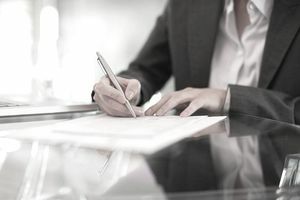 A will that's partially typed but with a few handwritten provisions can be declared entirely void, or the court simply won't honor the handwritten segments. You can make small changes to your will by creating a codicil. This might be appropriate if one of your beneficiaries has gotten married and you want to update her name, or if you've decided that you'd rather name someone else as executor. A codicil is a secondary document attached to your original will, spelling out the change you want to make. Most states require that a codicil is prepared and signed according to the same rules that apply to wills. If your state requires that two witnesses watch you sign your will, you'll need two to watch you sign your codicil as well. You may be able to change your will by simply replacing its personal property memorandum. A personal property memorandum attaches to your will just like a codicil. This option only works if you initially included a memorandum at the time you made your will. It's appropriate if you're leaving specific bequests to certain beneficiaries rather than dividing your overall estate among them, such as 25 percent to each of your four children. If you no longer own a certain item of property or you want to change who should receive it, you can simply detach the old memorandum and replace it with a new one. Unlike a codicil, a memorandum typically does not have to be signed or witnessed, but you must refer to it in your will with a statement like, "I leave my personal property to my four children according to the memorandum attached to this will." You can't later add a memorandum to make changes if your will doesn't mention one. It's often easiest to just revoke your old will and write a new one if you want to make substantive changes, especially if your state requires that you follow all the same legalities for a codicil as you would if you were going to make a will. And if you're making several small changes to your will or a significant one like changing your beneficiaries, this is often the safest option. The critical part is making absolutely sure that your previous will is not honored after your death—you want your changes to prevail. Specifically, state in your new will that you're revoking all previous wills, and list them all by date if you've made more than one over the years. Now get rid of the others. Exactly how you should go about this depends on state law, so this is another reason you might want to consult with an attorney. You may be able to write "REVOKED" on each page of your old will and sign or initial each page as well. Ideally, you'll call together witnesses to watch you tear it up or burn it, stating to them unequivocally that you're destroying your previous will. The court can't honor something that no longer exists, and your witnesses can testify to the occasion in court if need be. Just make sure you destroy any existing copies as well.